It’s a shame because I’ve only cooked steak at home when I’ve been able to find a really good cut. I kept ruining these great cuts because I just hadn’t found a good, straightforward recipe. That ended when I found Alton Brown’s best steak recipe, the best that I’ve ever used, and it hasn’t failed me yet. If you’d like to skip to any part of this review in particular, just use the table of contents below. Otherwise read on for the whole recipe, you’re going to like it. 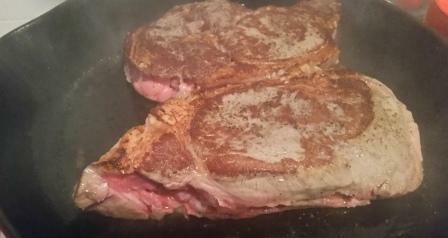 You start with your favorite cut, I like Ribeye but you may prefer another, (for cuts like Porterhouse see our post here). 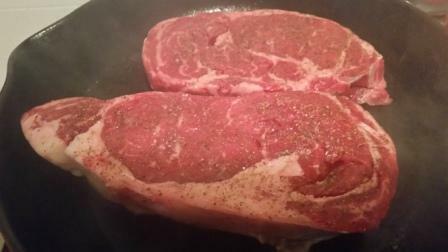 To season the steak, you just need salt and pepper. Salt with kosher salt on all sides, then add pepper to each side. Then take your favorite cast iron skillet (if you don’t have one, use your heaviest pan) and put it in your oven. Preheat your oven to 500 degrees Fahrenheit, usually at or near the highest setting in a home oven. It may take awhile to get to temperature, most ovens vary and you may even want to use a oven thermometer to make sure you’ve hit 500 degrees. Or just wait until you know for sure. Once your oven is at temperature, fire up your most powerful cooktop or rangetop burner and turn it to its highest heat setting (preheat if you have an electric burner). Now, get your heavy duty oven mitts. Take the skillet out of the oven and put it on the fired-up burner, quickly shut the oven door to keep the oven at temperature. Let the skillet sit on the burner’s high setting for 5 minutes. You are super-heating the skillet for maximum sear. 30 seconds and don’t touch it, just listen to it sizzle. Don’t touch it! Let it sit there for the whole 30 seconds untouched, while you imagine how great your dinner is going to be. It will smoke like it does in these pictures above as the canola oil hits the super-heated pan. When the timer’s up, use tongs or a spatula to flip for another 30 seconds. You can see here the sear that has already made its mark on the first side. When time is up, congratulate yourself, you now have seared your steak! This is simple and short, make sure you remember to have your oven mitt on. Take your skillet and put it in the oven. Try to minimize the time your oven door is open by synchronizing the oven door opening with your putting it in the oven! You don’t want to lower your oven temperature too much! Shut the oven door and cook for 2 minutes. Then, put on your oven mitts if you’ve taken them off. Take the skillet out of the oven and place it on your rangetop and flip the steak(s). Leave your oven mitts on and put the skillet back in the oven for another two minutes. If you prefer medium, add a minute to each side in the oven. Once time is up, it’s done! One slight tweak that I’ve made to this recipe is very simple. Once I’ve cooked the first two minutes in the oven, I add some cooking power by going to full broil for the second two minutes (or longer for more well done). You may even want to adjust your oven rack to the highest or a higher position if you haven’t already. This final tweak will put a nice crispy sear to the top of the steak, which for me is a perfect finish. As soon as time is up, use those oven mitts to take the skillet out of the oven and let the steak rest. Don’t touch it, don’t even look at it! You can just smell it and realize you’ve done something great here. You’ve climbed to the pinnacle of meat preparation. One alternative is to add butter during the oven cooking time, after the first flip, if you want to duplicate a steakhouse taste profile. Melt a dollop of butter on the top of the steak as it cooks and you’ll have that taste. I prefer my steak more pure, or “steaky”. A big glass of red wine. Sure, you can choose a cabernet sauvignon. That’s what they usually tell you to pair with a steak like this. If you really want a slap across the face though (in a good way), go get yourself a California old vine Zinfindel. Some of these grapes have been growing in California since before it even became a state. These wines are the equivalent of sour patch candy, for adults. It’s not that they’re sour its that they’re spicy and in a good way. There’s plenty of reasonable choices here and a good selection can be found in most grocery stores or wine stores. Just sautee a bunch of spinach, enough to fill your pan, in olive oil with some diced garlic. It will reduce a lot as the water is cooked out of the spinach. After the spinach is cooked down and infused with olive oil and garlic, add some sliced cherry tomatoes and burrata cheese, if you have it. Burrata is a much richer version of mozzarella that is sometimes hard to find but worth trying if you haven’t already. It’s a nice added touch to the dish. You add the tomatoes and torn cheese to the hot spinach and let the heat infuse through them. Alternatively, just make your favorite salad, or even liquid greens! By expertly cooking this steak, you’ve advanced thousands of years in civilization in the space of six minutes. Starting with raw beef that would have only been edible to pre-civilized, fire-less cave dwellers, you’ve refined it with the aid of fire into a piece of seared perfection. 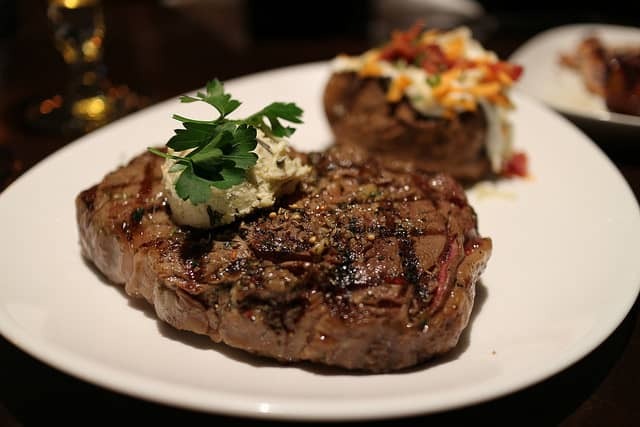 You can be proud that this steak would happily be served in any steakhouse with a 150% markup! 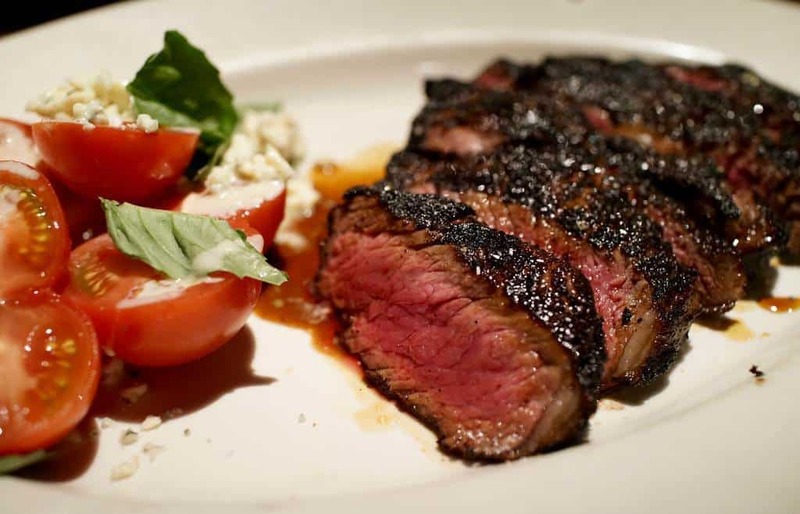 So consider that and congratulate yourself while eating the best steak you’ve ever cooked at home. How to make a fish steak? I always fail to make a fish steak. This looked so good and easy I had to try it. This is why I wanted to tell you that it turned out to be wonderful. The steak turned out just perfect not to dry or to juicy. I made it for my husband and he absolutely loved it. great looking dish. Looks very tasty and flavorful. thanks for sharing.